March 15, 2018 – Thuwal, Saudi Arabia: King Abdullah University of Science and Technology, (KAUST) and the Bruker Corporation signed a Memorandum of Understanding (MoU) today officially launching the KAUST-Bruker Center of Excellence (CoE) in Magnetic Resonance. The agreement marks the culmination of a long and mutually beneficial association between the two organizations. The reputation of KAUST as an internationally respected, scientific research facility is dependent on providing optimum services to the Kingdom, the region and the international scientific community. This reputation is maintained by fully servicing research requirements. "Scientific advancement is dependent on the close relationship between research and technological developments," said Distinguished Professor Jean M.J. Fréchet, senior vice president for research, innovation, and economic development at KAUST. "The KAUST-Bruker CoE offers all KAUST users the exceptional opportunity to work with technologies at the very frontline of innovation; adapting them to suit their specific research needs. This CoE will also serve as a launchpad for new technologies, providing the region with an international demonstration and training site." This level of enhanced support from Bruker, in conjunction with the University's expert staff, comprehensive research ecosystem and magnetic resonance research infrastructure, places KAUST in a preeminent position in Saudi Arabia, the region and the international scientific community. "Bruker's philosophy of relentless innovation and our long track record in developing leading analytical instrumentation and enabling scientific tools is based on close relationships with our customers," said Dr. Frank Laukien, President and CEO of Bruker Corporation. "Our long and fruitful relationship with KAUST and its world-class researchers is an example of how a symbiotic vendor-customer relationship leads to better instruments and scientific outcomes." 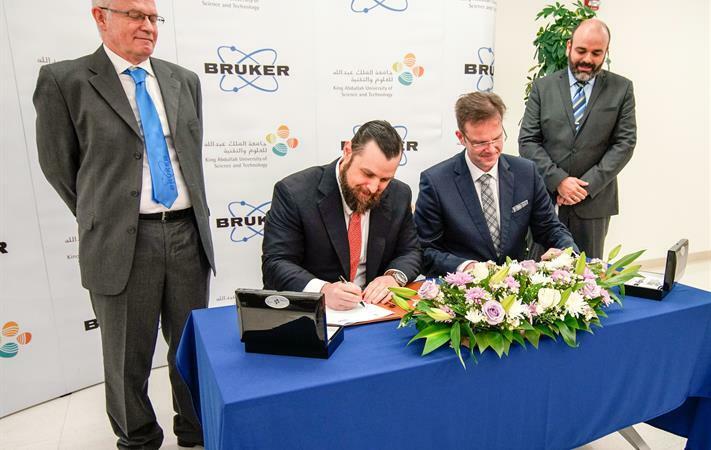 The daylong program of events marking the new partnership included a tour of the KAUST Imaging and Characterization Core Lab, and concluded in the Nuclear Magnetic Resonance (NMR) unit, where a number of Bruker technologies were demonstrated. These included the world's first 900 MHz wide-bore NMR spectrometer, the 950 MHz NMR, the Dynamic Nuclear Polarization (DNP) NMR system, as well as the first 500 MHz super wide-bore MRI spectrometer. A technical forum was also held, including talks by Bruker delegates, members of the KAUST faculty, and staff from the KAUST Core Labs, to showcase Bruker technologies and their applications in research and scientific development. The launch of the KAUST-Bruker CoE is part of an effort to closely align KAUST with world-class vendors. CoEs function as on-campus technology hubs–primed to train and inspire students and staff. The level of commitment inherent in such partnerships positions the University as an active participant in technological developments, underscoring its commitment to, and impact on, the scientific ambitions of the Kingdom. Established in 2009, KAUST is a graduate-level research university located on the shores of the Red Sea in Saudi Arabia. The University is dedicated to advancing science and technology through interdisciplinary research, education and innovation. Curiosity-driven and goal-oriented research is conducted by students, faculty, scientists and engineers to address the world's pressing scientific and technological challenges related to food, water, energy and the environment. Visit kaust.edu.sa for more information. For more than 55 years, Bruker has enabled scientists to make breakthrough discoveries and develop new applications that improve the quality of human life. Bruker's high-performance scientific instruments and high-value analytical and diagnostic solutions enable scientists to explore life and materials at molecular, cellular and microscopic levels. In close cooperation with our customers, Bruker is enabling innovation, improved productivity and customer success in life science molecular research, in applied and pharma applications, in microscopy and nanoanalysis, and in industrial applications, as well as in cell biology, preclinical imaging, phenomics and proteomics research, microbiology and molecular pathology research. For more information, please visit: http://www.bruker.com.